TheWiseJobSearch: What keeps YOU from following up??? The vast majority of people will tell you that it’s a good idea to send a Thank You note after a job interview. Yet only around 25% of them ever actually do it! There’s a large disconnect between what they say they believe, and what they actually do. As a result, it’s not hard to distinguish yourself from the majority of other candidates. Send a Thank You note after an interview! Set yourself apart even more so by sending an email Thank You note after EVERY contact, after each conversation, meeting, or email you may receive from them. A very brief acknowledgement of the contact, written professionally and without typos, signing off with your contact information so they always have it handy, does nothing but make a positive impression. They don’t want to come across as a “stalker”. While I agree that it’s a bad idea to hound someone, I find that most job seekers believe they are a stalker LONG before the employer ever feels stalked. Most people are too reluctant to be persistent. Being professionally, and pleasantly persistent is key. An employer that receives a call or email from someone that is professional, respectful, brief, to the point, upbeat, and humble will not be put-off. Rather, much more likely to be impressed by the interest, and the way the person communicates and presents themselves. They will also notice that the candidate is different from other candidates, because the vast majority of people don’t do it. It’s common, when I ask someone if they followed up after an interview or some other connection for them to say they “forgot”. In most cases I don’t think it’s their memory that kept them from doing it, but rather that they didn’t know how to do it well. Assuming, wrongly, that no follow up is better than saying something in a less than ideal way. While it is critical that a note has no spelling errors, terrible grammar, or slang, there are generally no magic words that need to be said. Whether it’s in a phone call or a note… brevity is a virtue. A simple “Thank you for your time and consideration” will make a positive impression, while no follow up makes none. They don’t want to appear “desperate”. They assume that following up and thanking the employer for each contact makes them look somehow ‘needy’. If each call and email sounds as if you’re practically begging for the role, then I would agree. However, if the follow up is done with confidence, with cheerfulness, and professional determination, it creates an impression of someone with resolve rather than desperation. 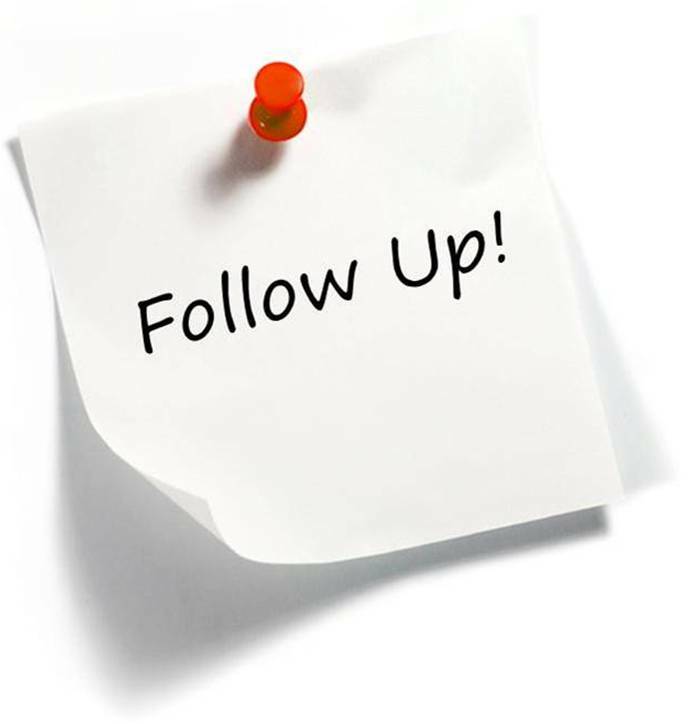 How you do the follow up matters. They underestimate the potential results. As a recruiter, seeing how my clients choose one candidate over another, it’s not uncommon for “little” things to tip the scale toward one over another when both seem closely qualified. It’s not uncommon to hear something like “This one seemed to be more interested, they sent me a Thank You note, and the other one didn’t.” Or, “This one was persistent, they called and followed up regularly, and were very thorough in the process.” It’s not always the most “technically qualified” person that gets the job. An employer wants to hire the best complete package. Communication, personality, professionalism, and tenacity have as much influence in the selection process as skills. So, as you go through your job search… making networking contacts and introduction calls, sending resumes, applying online, going to interviews and making other connections… how well do you follow up? Be consistent. It does make a difference!